(about) normal to it, regardless of how they are modelled for the analysis. Moreover, the rules for calculating the confinement reinforcement in such walls are also given considering a single integral section. So, it is most convenient for the subsequent phases of dimensioning and detailing to model walls with any section as a single storey-tall 3D beam element having the cross-sectional properties of the entire section. The only questions on the approach may refer to the modelling of torsion in walls with section other than (nearly) rectangular, as detailed after the next paragraph. An alternative to the single-element modelling of a wall with a section consisting of connected or intersecting rectangular segments is to use a separate 3D beam element at the centroidal axis of each rectangular segment of the section. To dimension and detail the entire cross-section in bending with axial force, as required for concrete walls by Section 5 of EN 1998-1, computed bending moments and axial forces of the individual 3D beam elements need to be composed into a single My, a single Mz and a single TV for the entire section. If these elements are connected at floor levels to a common mathematical node (e.g. through absolutely rigid horizontal segments or equivalent kinematic constraints), the model is completely equivalent to a single 3D beam element along the centroidal axis of the entire section. With the possible exception of walls with a semi-closed channel section, compatibility torsion is not an important component of the seismic resistance of walls. So, accurate estimation of torsion-induced shear for the purposes of the design of the wall itself is unimportant. The relevant issue is whether potentially unrealistic modelling of the torsional stiffness and response of a wall with a section other than (nearly) rectangular significantly affects the predicted seismic action effects in other structural members. If storey-tall 3D beam elements with the cross-sectional properties of the entire section are used, then a step to improve the accuracy of the prediction of seismic action effects in other members is to place the axis of the 3D beam element modelling the wall through the shear centre of its cross-section, instead of the centroidal axis. For L- or T-shaped sections this is very convenient, as the shear centre is at the intersection of the longitudinal axes of the two rectangular parts of the cross-section, which typically coincide with the axes of the webs of beams framing into the wall. Placing the axis of the wall element at the shear centre of the cross-section rather than at its centroid introduces an error in the calculation of the vertical displacement induced at the end of a beam connected to the corresponding node of the wall through a horizontal rigid arm by the flexural rotation of the wall. Another issue is that the estimation of the torsional rigidity, GC, of the cross-section assuming pure St Venant torsion (i.e. as GX(/wfew3/3), with /w and bw denoting the length and thickness of each rectangular part of the section) does not account for the resistance to torsion-induced warping of the section. In considering these problems, though, the designer should bear in mind the large uncertainty regarding the reduction of torsional rigidity due to concrete cracking, as described in Section 4.6.4 (last paragraph). 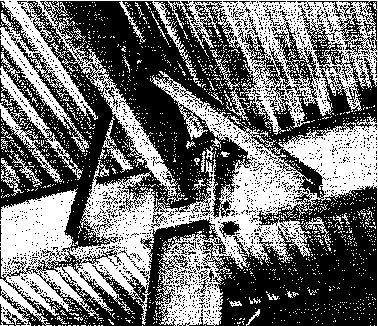 Beams framing into the wall at floor levels, etc., should be connected to the mathematical node at the axis of the wall. Any eccentricity between this node and the real end of the beam should be modelled as a rigid connection. If eccentrically framing beams are at right angles to the plane of the wall (i.e. in its weak direction), it is more accurate to include some flexibility of the connection, if this is computationally feasible: the very stiff or rigid connecting element between the end of the beam and the node at the wall centreline may be considered to have a finite torsional rigidity, GC = GhstbJ/3, where hst is the storey height and £>w is the thickness of the web of the wall.